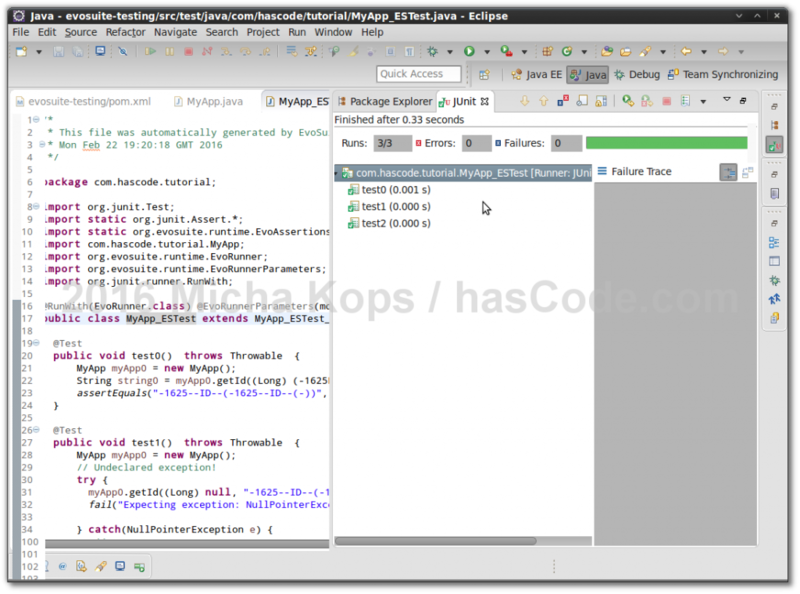 Running generated JUnit test in Eclipse IDE. This is our application under test. To verify the ability to create test cases for the different branches of execution flow, we’ve chosen to implement a method with a cyclomatic complexity > 1. For a seamless integration, we need to tune our pom.xml by means of..
We’re now ready to generate test suites using maven. [INFO] SLF4J: Class path contains multiple SLF4J bindings. [INFO] SLF4J: See http://www.slf4j.org/codes.html#multiple_bindings for an explanation. This is how our generated test looks like. We can see that three single tests have been added covering each branch in the control flow. In addition to this tests, a scaffolding class for the test is generated (MyApp_ESTest_scaffolding), we may fine-tune the testing environment here, setting system properties, global timeouts etc.. This entry was posted on Sunday, February 28th, 2016 at 5:22 pm	and is filed under Java, testing. You can follow any responses to this entry through the RSS 2.0 feed. You can skip to the end and leave a response. Pinging is currently not allowed. Hey, what about when you have private or protected methods ? Does it deal with it ? i managed to get to the mvn evosuite:generate step. however, after processing, it did mentioned how many jobs left to complete and so on. however when it finally ended, it just prompt the message saying unable to generate test suites. zero generated. zero coverage. i am wondering how do u manage? did you encounter this situation when running EvoSuite on your own project or when applying in to this tutorial’s sources? Which parameters did you pass for memory, cores and time-per-class? The output directory is writable?